Mass coral bleaching events have increased in frequency and severity over the past two decades associated with anomalously high sea surface temperatures. These events have produced wide-spread coral mortality and significant ecological, social and economic impacts to coral reefs and the communities that depend on them. What can local coral reef managers do to address coral bleaching events? While the fate of coral reefs will be determined by a variety of stressors including the rate and extent of climate change, the new report “A Reef Manager’s Guide to Coral Bleaching” concludes that reef managers have a critical role to play in maximising the resilience of reefs to coral bleaching. The Reef Manager’s Guide provides information on the causes and consequences of coral bleaching, and management strategies to help local and regional reef managers reduce this threat to coral reef ecosystems. 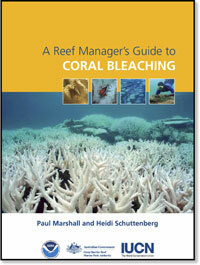 Produced by the National Oceanic and Atmospheric Administration (NOAA), the Australian Great Barrier Reef Marine Park Authority (GBRMPA), and the International Union for the Conservation of Nature (IUCN), the Reef Manager’s Guide includes contributions from over 50 experts in coral bleaching and coral reef management from 30 organizations. Can Corals Adapt To Climate Change?